During a play fight Mila draws on her cousin's face in red pen, and Pandora runs to tell on her. Mila is outraged when she gets spanked for it, and vows revenge. 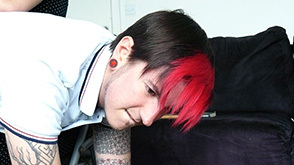 She'll colour Pandora's bottom red too! Sebastian comes home and Pandora smells smoke on his breath. 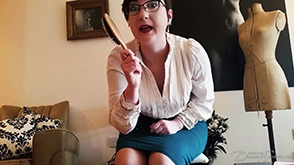 He's broken their discipline agreement to help him quit - and that means a long, hard session over her knee with the wooden hairbrush. Hand spanking, pure and simple. Intimacy, trust, affection - and 20 minutes of hard over the knee spanking, increasing speed and severity until Pandora's bottom and thighs are red and sore. Pandora is caught striking Nimue in the playground, and Mr Cameron is furious. Trapped in a leg lock, the wayward schoolgirl endures the hardest, fastest, most relentless hand spanking of her life.